The Chinese have a great influence in our cooking and have accepted many of their food stuffs like siopao, lugaw, hopia and many others. 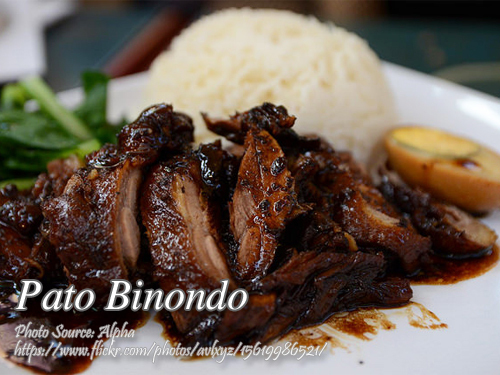 Below is a duck dish specifically called Pato Binondo, a place in China town. Actually this is simply a Chinese-style braised duck with a rich and syrupy sauce. Chicken may be successfully substituted in this recipe. Cooking time will be reduced to about 45 minutes depending on the size of the chicken. To cook pato binondo; Rinse duck and dry. Bend leeks and insert into duck cavity. Stuff in also 1 whole onion and 1 piece ginger. Put duck in a bowl and add the rest of the ingredients. Let it marinate for 10 minutes. Drain duck and save marinade. In a large casserole, heat cooking oil, about 1 cup and brown duck. Remove excess oil leaving about 1/4 cup. Return duck to casserole. Add marinade and 1 cup water. Simmer over low fire till tender about 2 hours, turning duck once. Toward the end of cooking turn up the heat to thicken sauce. To see the complete recipe and lists of ingredients in exact measurments, continue reading. Rinse duck and dry. Bend leeks and insert into duck cavity. Stuff in also 1 whole onion and 1 piece ginger. Put duck in a bowl and add the rest of the ingredients. Let it marinate for 10 minutes. Drain duck and save marinade. In a large casserole, heat cooking oil, about 1 cup and brown duck. Remove excess oil leaving about ¼ cup. Return duck to casserole. Add marinade and 1 cup water. Simmer over low fire till tender about 2 hours, turning duck once. Toward the end of cooking turn up the heat to thicken sauce. Slice and serve with steamed rice. Huh? What happened to the black mushroom? Was it also added in the marinade? Please read the recipe again. It says “add the rest of the ingredients”.